In Canada, every province/territory has a newborn screening program. The inherited diseases included in the provincial/territorial programs vary significantly as there are no nationwide standards for the conditions required for screening. All provinces screen for phenylketonuria (PKU), congenital hyperthyroidism (CH), and medium-chain acyl-CoA dehydrogenase deficiency (MCADD). Saskatchewan is the only province/territory that requires screening for CH and PKU by law. A number of provinces/territories also screen for conditions such as cystic fibrosis, and other metabolic and endocrine conditions. In recent years, a number of new tests have been added. Some provinces have expanded the number of conditions required for screening, while others have not. The Canadian Organization for Rare Disorders provides the full list of conditions in newborn screening programs by province and territory. Consent for newborn screening is usually “implied,” but parents have the right to opt out of newborn screening. Most provinces provide guidelines for formal documentation when the parents opt out of newborn screening. In Canada, newborn screening programs are used for conditions that respond to early treatment and support, which alters the course or severity of the condition to improve the child’s wellbeing. However, management or treatment for these conditions is a lifelong process that can be challenging and costly. 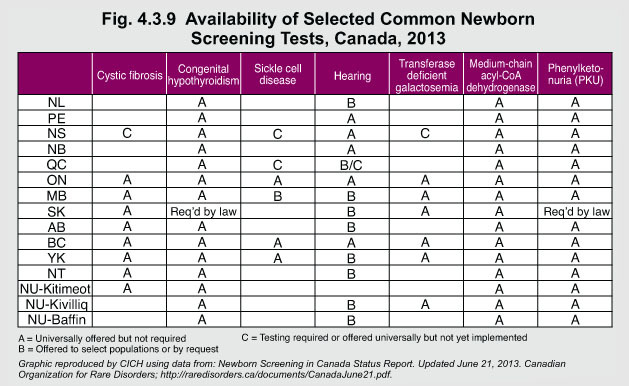 Many provinces instituted newborn screening using tandem mass spectrometry, which screens for approximately 40 hereditary metabolic conditions consistent with the guidelines of the American College of Medical Genetics.1 More consistent newborn screening policies need to be developed because the full range of newborn screening tests are not uniformly available across Canada.